Besides warmer temperatures, the arrival of spring also brings the return of flowers, leaves, grass, and a host of other lifeforms as winter's cold grasp recedes. But unfortunately, that list also includes insects, and not the cute ones like lady bugs or caterpillars. No, we're talking Mother Nature's smallest predators, the ones with a thirst for blood. Your blood. But you don't have to let them ruin your leisure time. Here's everything you need to fight back and reclaim the spring and summer from the bugs, in the name of all mankind. Sometimes the simplest approach can be the most effective. And while we all know that bugs are attracted to light, they apparently avoid this particular shade of yellow like the plague they're probably carrying. Of course, it's mother nature that got us into this mess in the first place. What real benefit is there to mosquitoes anyways? So it's time to turn her own creations against her tiny blood-sucking monsters. But maybe you haven't suffered at the hands of mosquitoes or deer flies enough to feel much anger towards them. If you'd prefer to deal with bugs in a more humane manner, this vacuum will safely trap them until you can return them to the wilderness. Sometimes the best offense is a good defense, and if you'd prefer to take a completely passive approach to dealing with flying and crawling invaders, this sleeping cocoon will keep everything smaller than a rat out. If you're hunting for a more industrial solution to your insect problem, a Propane Magnet Trap can protect up to an entire acre for as long as its tank is full of fuel. But what if there was a way to turn an insect infestation into a pro instead of a con? All those mosquito corpses have to be good for something right? They certainly are. At least when killed and harvested by this Flypaper Robotic Clock. 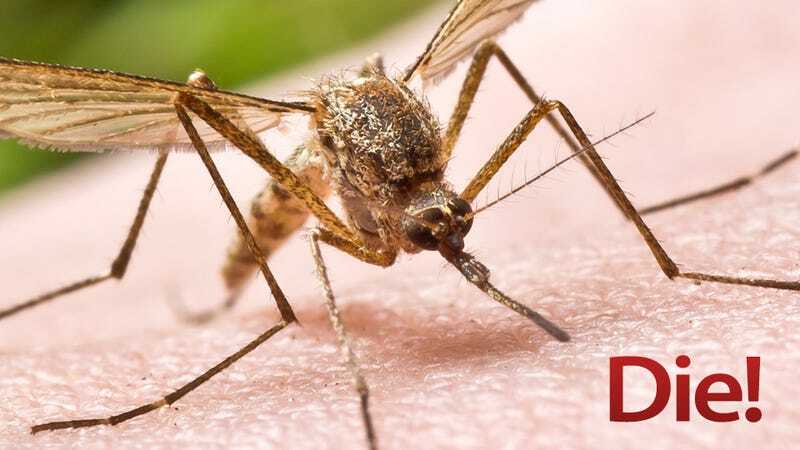 If laser technology is accurate enough to shoot down spy satellites and inter-continental ballistic missiles, it has to be capable of knocking mosquitoes out of the air, right? They most certainly can as this video demonstrates.